Carbon control: a “Robin Hood tax” or double profit? By data of recent researches, introduction of a tax on carbon dioxide emissions will give a USD 1.5 trl. increase to American budget and will become an instrument for the “therapy” of financial deficit. If Russia does not adopt a system of control on greenhouse gas emissions, it will make itself vulnerable against international carbon taxes after it declined to participate in the second stage of the Kyoto Protocol, - experts believe. American scholars from the Massachusetts Technological Institute calculated effect of the carbon emission tax starting of 2013 with consideration of a 4% annual growth. The research showed that introduction of such tax will by 2050lead to 20% reduction of the carbon dioxide emissions compared to the level of 2006; in addition, it will stimulate exploitation of renewable energy sources and reduction of the amounts of oil import. The proposed by republicans bill “The Managed Carbon Price Act 2012” starts with a modest fee of $12,50 per 1 ton of CO2 with following increase of the cost up to $125 per 1 ton of CO2. The bill eliminates the necessity of quota sales and obliges producers to buy emission permits. It is planned to return 75% of profit on emission quota sales to energy efficiency increase and investments in renewable energy sources. The rest 25% of the profit are planned to use for covering the budget deficit. As authors of the bill claimed, this act is designed to protect local producers against international carbon protectionism. 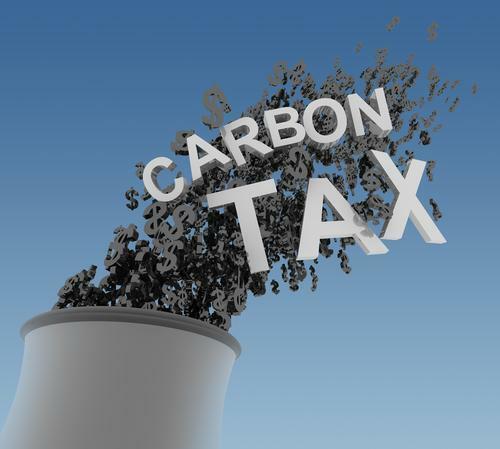 Enthusiasts of the carbon tax support the idea of double dividend. According to it, economic incentive for environmental protection and resource saving through introduction of ecological taxes should be accompanied by concurrent proportional reduction of the tax burden connected with social payments; that should inspire employment growth and support competitiveness of national producers. The idea is, the carbon dioxide emissions tax might replace a huge set of taxes which go to the state’s budget in the result. However, collections made under such scheme, unlike the modern taxation, have a true resource provision and are fairer. As far as Russia is concerned, representatives of the Russian business have been advocating Russian internal limitations and gradual movement towards establishment of an internal market of emission sales. The Russian Union of Industrialists and Entrepreneurs, which is ready to sell carbon reductions only under the frames of the Kyoto Protocol, finds these proposals murderous for the carbon intensive industry. Analysis of risks and benefits of introduction and deficiency of “greenhouse” control carried out by experts of the Combined Group of the RF Ministry of Economic Development together with the “Business Russia” showed the necessity of such regulations both for long-term perspective and from the nearest pragmatic interests’ viewpoint. In the result of the fact that Russia is canceling its participation in the second stage of the Kyoto Protocol Liabilities, it becomes extremely vulnerable against so-called carbon protectionism, i.e., measures of other states on protection of their producers against competitors not burdened with limitations on greenhouse gas emissions. Carbon capacity of the Russian export, as well as carbon capacity of GDP, by expert estimates is close to 4 kg CO2 equivalent per 1 dollar. This is 10 times higher than in the European Union and 15–20 times higher than in Japan. The “greenhouse content” amounts to no less than 5% of the total cost of export. The greenhouse component can very well become a subject of customs’ or other kind regulating from the part of Russia’s trade partners in the nearest future. There already is a legal norm in the European Union allowing to include sectors of high carbon capacity into the European system of emission trade. Carbon emissions tax is nowadays positioned as the most economically efficient way to give the market pricing signals which stimulate reduction of investment in the fossil fuels and increase of investments in clean technologies, experts believe.